We were in luck. It was new moon and the tide was at its lowest. 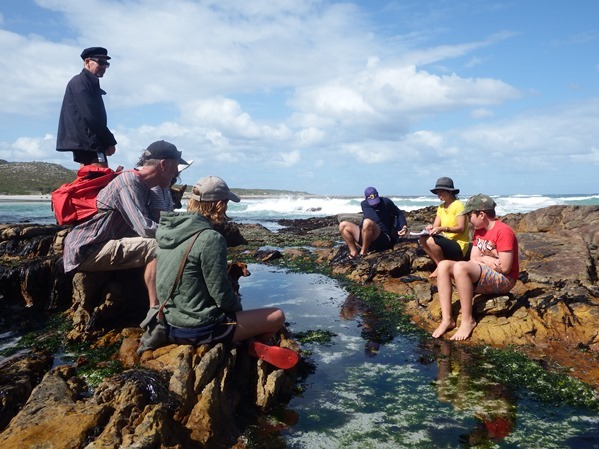 The swell was also gentle that day, giving us plenty of time to explore the intertidal rock pools near Scarborough beach on the Cape Peninsula. It all started when Hiromu Jimbo, a young Japanese man who’d spent three and a half years travelling from Istanbul through Europe and then down through Africa on a bicycle, turned up at the Good Hope Gardens Nursery, Cape Point. He came for 10 days and landed up staying a hundred. Jimbo introduced Roushanna Gray to “the joys of eating and preparing seaweed”. Coming from a country where seaweed is a daily food and a highly prized delicacy, Jimbo was amazed that South Africans were oblivious to what was on their doorstep. 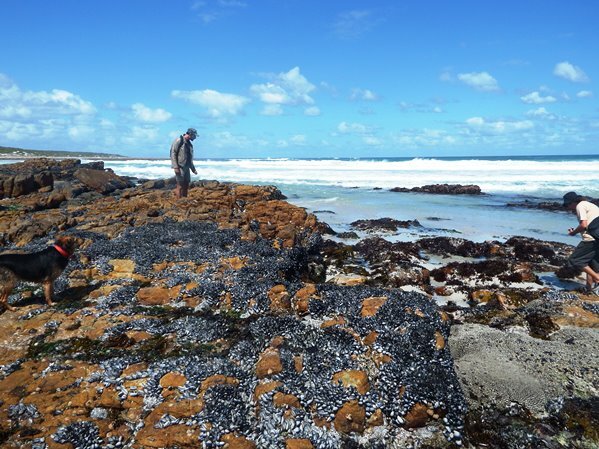 The South African coast has more than 700 species of marine algae. Out of all of these, there is only one inedible species – acid weed (Desmarestia firma), a fan-shaped brown algae with serrated edges that contains sulphuric acid. Gray now runs teaching expeditions on coastal foraging. Before embarking, she gives us a brief introduction and talk on sustainability. Always collect as close to the tide line as possible. Never detach seaweed from its holdfast on the rock; rather trim no more than a third with a pair of scissors. It will then regrow; some of our kelps grow a centimetre a day. There are kelps that grow more than half a metre a day. It is a highly sustainable food source. But you must have a permit, which is easily obtainable from the post office for R95 and is valid for a year. Take your ID. And another word of warning – never turn your back on the sea. Waves have a way of sneaking up on you. My experience of consuming seaweed hadn’t gone much beyond nori. I had also eaten salt marsh samphire (Salicornia meyeriana) or sea asparagus at chef Kobus van der Merwe’s marvellous spot in Paternoster. Wild nori or purple laver (Porphyra capensis) grows abundantly along our coast in stacked sheets that look like black plastic when dried out at low tide. Its cousin, Porphyra yezoensis, is the Far East nori familiar to us in sushi. Many of us also know and use agar (popular as a gelatin for vegetarians). Agar-weed (Gracilaria gracilis) grows along the west and south coast, some of it is exported from Saldanha Bay. Agar is found in many gelatinous red algae, and local saw-edged jelly-weed, which is harvested commercially. The seaweed industry is currently worth a few million rand to South Africa, but it’s a pathetic drop in the ocean, compared with its economic potential. The least weird to eat for novices is ribbon sea lettuce (Ulva fasciata) and rigid sea lettuce (Ulva rigida). Gray uses it in sea biscuits, chilli bites and couscous salad. I’ve since added it to miso soup for novelty and colour. Slightly more courage is needed at first to get to grips with red slippery orbits (Pachymenia orbitosa). Gray says these are good for wrapping roasts or in soups. Split fan kelp (Laminaria pallida) and sea bamboo (Ecklonia maxima) can be put through a pasta machine and turned into a seaweed tagliatelle. If you boil the whole leaves for two hours you can use the sheets as lasagne. Gray also makes glass noodles by shredding a jelly created by freezing the leftover liquid after boiling red seaweed. But my favourite seaweed is hanging wrack (Brassicophycus brassicaeformis) which can be used raw in coleslaw, together with “mermaid’s hair” or Cape cord weed (Chordariopsis capensis). If the latter is hair from a mermaid I think I know from which of her regions. You can also drizzle it with soy sauce or sauté in butter with garlic. Being of Belgian extraction, I was looking forward to collecting mussels. First thing, though, you must be absolutely certain that there is no red tide about. Foragers should also take care that they do not pick our indigenous black mussels, which are being rapidly displaced and outcompeted by the alien Mediterranean mussel. One good, unintended consequence of their success, though, is that oystercatcher bird populations have recovered thanks to the Mediterranean mussels. The species are not too hard to tell apart, once someone has shown you the difference. To my mind, the local mussels have more elegant lines. As for flavour, I challenge anyone to tell them apart in a blind tasting. If you’ve ever wondered about the different colours of mussel flesh, dark brown or orange are female; off-white and pale yellow are male, depending on the species. We also picked a few limpets to add to the shellfish mix. Gray makes sustainable limpet and periwinkle samoosas. Goat’s eye limpet is popular (too popular, in fact) along the Eastern Cape coast. 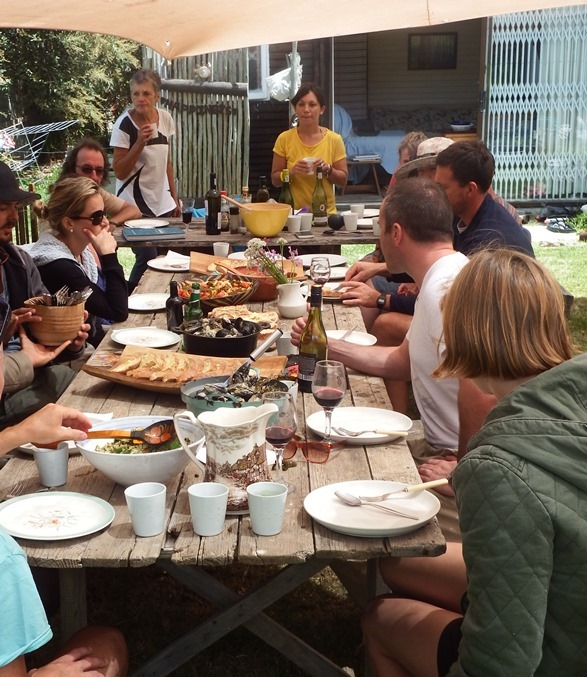 After our morning on the rocks, we hike up to Gael’s Beach Cottage with our foraged sea edibles to prepare an alfresco lunch in the backyard. Every­one pitches in. While we wait for the rinsing and boiling, Gray prepares a face mask from dead-man’s fingers (Splachnidium rugosum). The swollen, tubular stems are filled with mucilage (which protects the algae in the sun at low tide). Squeezed out and applied to the face it seems to be absorbed after a while and your skin feels unusually plump. Then comes the scary, hairy red algae called tongue-weed (Gigartina polycarpa). It works well as a loofah to exfoliate after the facial. Its carrageenan is also used as a gel. And if you don’t quite look the same afterwards, you can be sure that you will never look at the sea rocks and kelp the same way again. This article first appeared in the Mail & Guardian on 26 March 2015.